Burning with Passion. Bursting with Power. 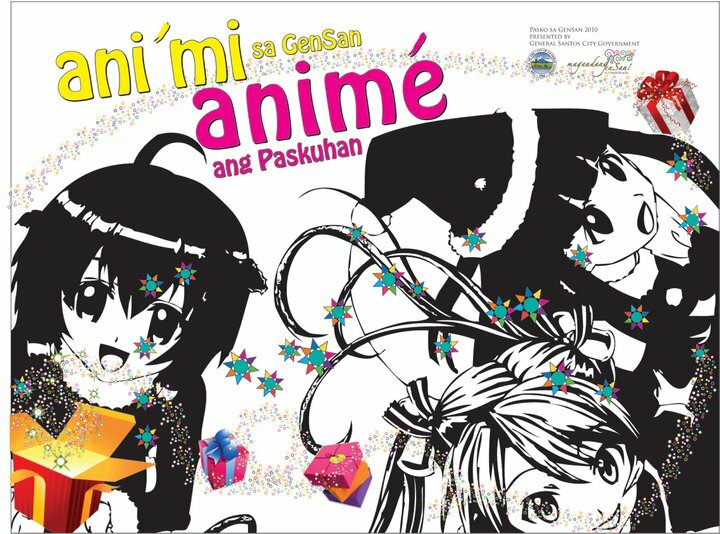 “Ani Mi sa GenSan, Anime ang Paskuhan”. I changed my Facebook Profile Pic to an Anime character. on December 6, 2010 for the Grand Opening Salvo. at the site where cool Anime characters are painted on canvass by talented students. I will go around the site to find out for myself whose Pavilions will stand out. I feel like I am 7 years old again, ready to relish every part of Christmas. Magandang GenSan at Maligayang Pasko! This entry was posted in Christmas and tagged Ani Mi Sa Gensan, Anime ang Paskuhan, Egai Cadiente, Oval Plaza. …,,hai po,,… c shad po ito.,mary amor marquez po real name q,,..ganda talaga ng mga messages kahapon..,mka inspire..,kya lang hindi namin masyadong narinig ang ibang messages,,.nasa likod po kac kmi nka upo..,hehe.,thanks for being part of our recollection..,ganda din nung mga messages ni Lord..,! see you next time po..,! I’m one excited general, as well, ate jo. It also brings out the child in me…even the murals around the flea market, are keeping me glued there…Everytime I pass by the Oval Plaza, I just find myself smiling. I agree with you, Lenlen!Just like you, I can’t help but smile (and giggle!) each time I pass by the Oval Plaza. Katuwa tingnan ang murals! Magpapa-picture ako sa bawat section, hehehe! i saw students nga sa Oval plaza the other day…i’ll bring my kids there..im sure mag-eenjoy sila!! See you soon, Ma’am Eunice! Excited to see you and your kids in Magandang Gensan! i do believe Gensan holds lots of potential on animation pero my goodness?! What happened to the stage design?! You call artist ang gumawa non? i can name generals who could have done that done better for free?! GENSAN should make use of its productive artist! ~as an active resident of General Santos City, Philippines, she is passionately involved in community developmental efforts. ~as a Mindanaoan, she is determined to show the whole world the beauty and bounty of the island that is usually misunderstood. ~as an educator, she equips college students to be ready to make a life, not just a living. She intentionally cultivates their competence and character. ~as an agent of transformation, she is Leaping Forward and Leading Change. ~as a grateful person, she knows how to savor simple joys and celebrate daily victories. Blog on, General Joana, blog on! I am Joining the Blogfest Soccsksargen 2.0! Thanksgiving – Today and Everyday! Ready for the Big Splash! What Do You Dwell On? Read As Much As You Can! Greetings of Joy and Peace! Hon. Manny Pacquiao Turns 32! Pacquiao Employees Celebrate Christmas the Fab Way! Thanks for making me a part of your day!